CIVIL JOBS FOR PILING AND PILE CAP FOR 5000 MT / 12500 MT CAPACITY OF SULPHURIC ACID STORAGE TANKS UNDER PA EXPANSION PROJECT. CIVIL SERVICES - PILING JOB FOR GYPSUM CONVEYOR. SERVICES FOR CIVIL WORKS FOR PILING FOR MCC / CONTROL ROOM, FLASH COOLER AND SCRUBBING BUILDING. CIVIL JOBS DYKE WALL FOR WHARF SA TANKS. CIVIL SERVICES - DYKE WALL, FLOORING & PUMP FOUNDATION AT 5000 MT / 12500 MT SA TANKS. VARIOUS TYPES OF TEST PILES (VERTICAL / PULL OUT / INTEGRITY ). BORING FOR 600mm DIA PILES THROUGH ALL KINDS OF SOILS INCL HARD MORRUM WITH GRAVEL AND ROCK FRAGMENTS. SUPPLY AND FILLING OF BORED HOLES WITH NOMINAL MIX 1:1.5:3 CONCRETE CONFORMING TO IS:456 USING PORTLAND SLAG CEMENT CONFORMING TO IS:455 with 20mm and DOWN COARSE AGGREGATE. 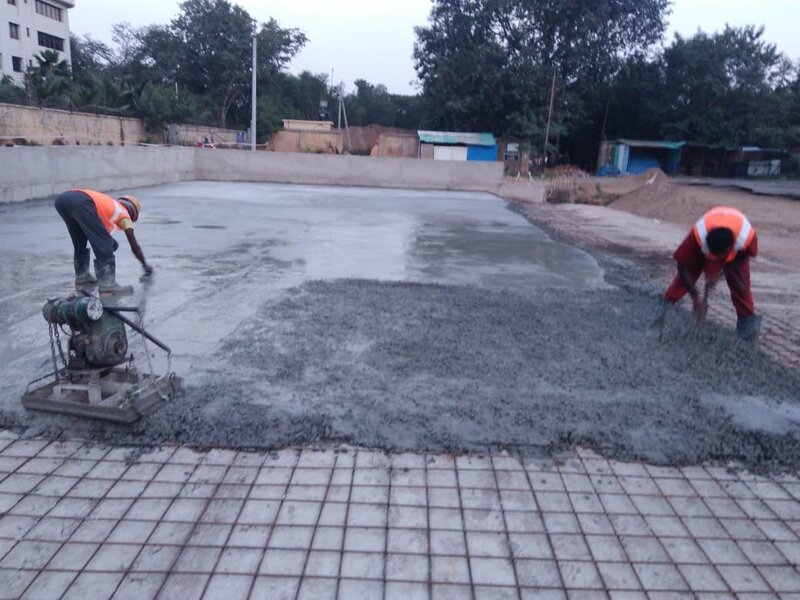 SUPPLYING AND PLACING OF RCC M35 GRADE FOR PILE CAP/RAFT SLAB. SUPPLYING AND PLACING OF SHUTTERING FOR PILE CAP/RAFT SLAB. PROVIDING REINFORCEMENT - HIGH YIELD STRENGTH DEFORMED (HYSD) Bars conforming to IS:1786 of Grades : Fe 415, Fe 500, Fe 550, Fe 600 and as per DRAWING and SPECIFICATIONS, INCLUDING STRAIGHTENING, DECOILING, REMOVING MILSCALES AND RUST, CUTTING, BENDING TO REQUIRED SHAPE, PLACING, BINDING IN POSITION, WELDING WHEREVER REQUIRED, SUPPLY OF OF APPROVED TYPE OF BINDING WIRE ETC., REINFORCEMENT BARS CONFORMING TO IS:432. EARTH WORK EXCAVATION INCLUDING BACKFILLING & DEBRIS. PROVIDING PCC 1:4:8 with 40mm crushed granite metal. SUPPLY AND FILLING OF MURRUM INCLUDING COMPACTION. FIXING OF HDPE LINER UPTO GYPSUM STRATA.